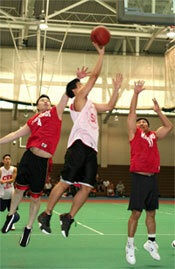 This year's Mens Friendship had a NACBAIT record 13 teams competing for the title. Following a long Saturday of round robin play, the top 6 teams moved on to Sunday's Medal Round. In the first QF, the 3-1 SF Wildcats met up with the 2-1 Montreal MMAC Mars. Montreal started off by taking a 14-7 halftime lead, as David Hsu proved to be the man early on. But in the second half, SF began to recover from their jet lag as they increased their scoring pace by 600%. Montreal then got themselves into some major foul trouble, and their thin bench became their nemesis. 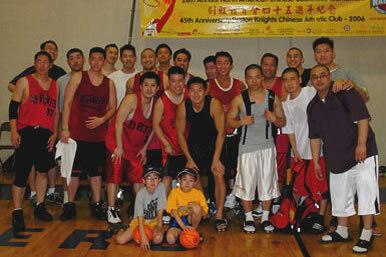 Mike Tsai and Ran Guo led a furious Wildcat comeback as the team scored 43 in the second half to win 50-46. Andy Chen paced Mars with 10. The second QF was 3rd seeded NY United East taking on the 6th seeded Washington CYC B. The first half was all UE with 6 foot forward Brian Hau (8 pts, 8 rebs) leading NY to an 18-16 edge. After the half, all-star point guard Kevin Lee (16 pts, 4 boards) took control for DC. With time ticking away, UE made a critical error and called a 4th TO that they didnt have. CYC didn't shy away from their stroke of good luck as they managed to sink from the freebie stripe to hold on 41-38 for the upset. In the Semis, the SF Wildcats continued their Cinderella run against the top seeded and undefeated Boston Warlords. Just as they did in the Quarters, the Wildcats fell behind by double digits right away. But they showed a flair for the dramatic as they picked up the tempo later in the game. The faster game caused Boston to take some rushed shots and led a couple uncharacteristic turnovers. The Wildcats managed to earn a 10 point win 52-42. Guard Mike Tsai tallied 21 and 3 treys for the Wildcats while gunner Joe Yen netted 17 for the Warlords. The other game of the Final Four saw the tournament favorite NY Rockits Alumni meet up with a young and undersized Washington CYC B team. Victor Tang carpe diemed the size mismatch as he dropped 15 and Rick Wong swished 3's all game long to give the Rockits a 46-39 dub. Kevin Lee (14 pts, 4 3's) and Terry Callier (11 pts, 12 rebs) led CYC. Finals time and it was the SF Wildcats versus the NY Rockits Alumni. The Rockits raced out of the starting blocks to take a quick 4 point lead, with Victor Tang (12 pts, 6 rebs) and Brian Wong (2 treys) filling it up from the inside and the outside. Ben Lee got off to a sizzling start for Frisco as he dropped in 9 in the first 8 minutes. Mike Tsai was also feeling it in the first half as he scored 7 of his 11 before intermission. NY slowly began to pull away as they stretched the lead to 10 in the second half. Despite the increasing deficit, San Fran kept right at it. 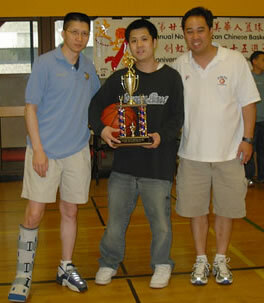 But every time the Wildcats would make a mini run, MVP PG Kevin Chung was right there for NY as he kept answering for the Rockits. Kevin played some excellent basketball, knocked down an amazing percentage of his shots, and led the NY Rockits to a 48-42 Championship win. Good job by coach Denny Lee and the New York Rockits Alumni in taking the Friendship title.